There are some people you want to follow, even if you’re not sure exactly where they’re going, because they will always take you somewhere interesting. Yair Yona is one of those people. Whether he’s playing one of his new pieces, jamming with other musicians, or writing about music on his blog Small Town Romance, I want to hear what he has to say. 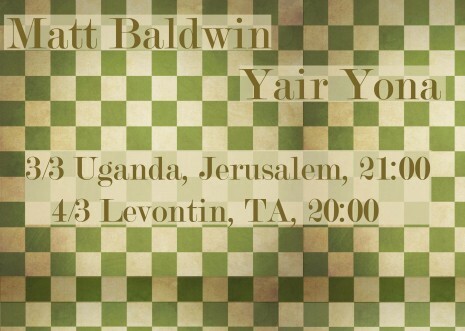 Coming up next from Yair Yona, in addition to his new album World Behind Curtains, are several intriguing concerts in Jerusalem and Tel Aviv, featuring American guitarist Matt Baldwin. Yona has written about Baldwin’s music, placing him somewhere between Popl Vuh, Ash Ra Tempel, Kraut Rock and David Gilmour, with Baldwin’s latest album Night in the Triangle making it onto Yona’s Best of 2011 list. Saturday, March 3 at Uganda, 4 Aristobolus Street, Jerusalem at 21:00, 02-6236087. Sunday, March 4 at Levontin 7, Tel Aviv at 20:00, 03-5605084. Layers Over Prayers will be an experimental evening. 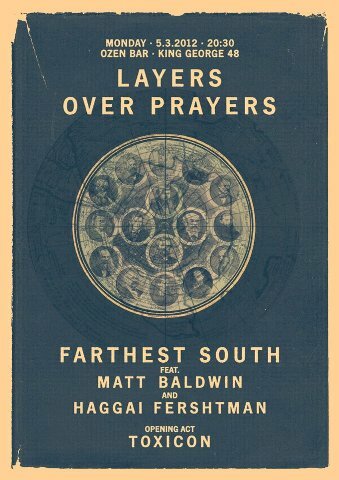 In addition to special guest Matt Baldwin, Farthest South members Yair Yona – bass & effects, Yair Etziony – bass, computer, electronics, and Barry Berko – guitar, will be joined on their daring explorations by Haggai Fershtman on drums with video art by Ran Slavin for an ALL IMPROV show. Toxicon will open this wild evening. Get ready for a Kraut rock, psychedelic, noise, industrial night. Links: Matt Baldwin myspace, Farthest South bandcamp, Matt Baldwin/Yair Yona facebook event page , Layers Over Prayers facebook event page.